Story was not original and cliched, even had the cheesy, hoakey qualities that make a common shoujo sometimes NOT enjoyable.. The characters themselves weren't developed and were too hoakey for my tastes. This is one of the few manga's that I have read and is irreplaceable! 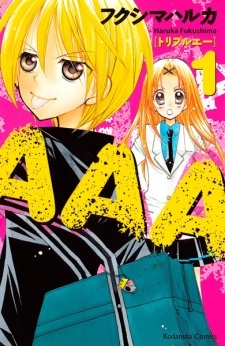 AAA is so cute and enjoyable that even after reading other romance manga's AAA will always still be fresh in your mind. I really loved this manga, the plot and the characters were both really interesting, and the hint of mysteriousness to the main character (Kuroda Hayato) really makes you love him! Although a typical story about a girl meeting her love and losing him has been done MANY times before, this one has a twist and keeps you interested! The art is great, and isn't cringing at all like some other manga's and the fact that you see the characters at some point without their school uniform really gives them their own sense of style which is great because it expresses their personality more to the reader. The characters are just lovable, and I'm not just talking about the main characters, the side characters are also really sweet. Although, the main character Aoi, does get annoying sometimes at what she says, you do not tend to dislike her. Overall, the manga is really interesting and one that everyone must at least try! El manga planea presentar una serie de situaciones muy variadas, llevando a nuestros protagonistas a estar juntos en situaciones bastante incomodas, la comedia resulta ser bastante buena por momentos, aunque no muy eficiente ya que a veces es algo forzada, por último el romance, puede resultar bastante “paposo”, mi manera de decir que es muy pegajoso, molesto y enredado, en algunos capítulos trasmite esa tensión de ¿Qué va resultar de todo esto? aunque no más que eso, concluyendo sin dejar cavos sueltos. What can I say I loved this manga so much. The characters are so amazing and it just makes me want to scream!!!!!!! I've re-read this manga like a billon time and am re-reading it again. The plot is amazing which kept me wanting to know more, the characters look so cool that one I saw them I was hooked. This manga brought me to tears from all the funny moments that my parents had to tell me to go to my room because I was to noisy (lol). That's about all I can say if you don't want spoilers but if you don't believe me on how good it is then read it yourself and hopefully you will enjoy it as much as I did.